BSC Pool&Spa has constructed and is currently taking care of the maintenance of numerous commercial pools and spas on Bonaire. A couple of dozen of those are currently Magnapools, and entrepreneurs increasingly decide to convert their existing chlorine pools into Magnapools. Would you like to construct a new Magnapool or do you want to convert your current pool into a Magnapool, just call us for an appointment and we will make it happen. You save on maintenance costs. BSC Pool&Spa maintains your pool professionally. This way, you'll always have a beautifully bright and safe swimming pool and/or spa for your guests. You don't have to worry about it yourself. The bigger and busiest pools are cleaned and balanced on a daily basis, We usually visit the smaller commercial pools a number of times a week for maintenance. When there's a problem, we'll come by to fix it withouth additional costs. For our maintenance, you pay a fixed amoung so that financially you know what you're up to. 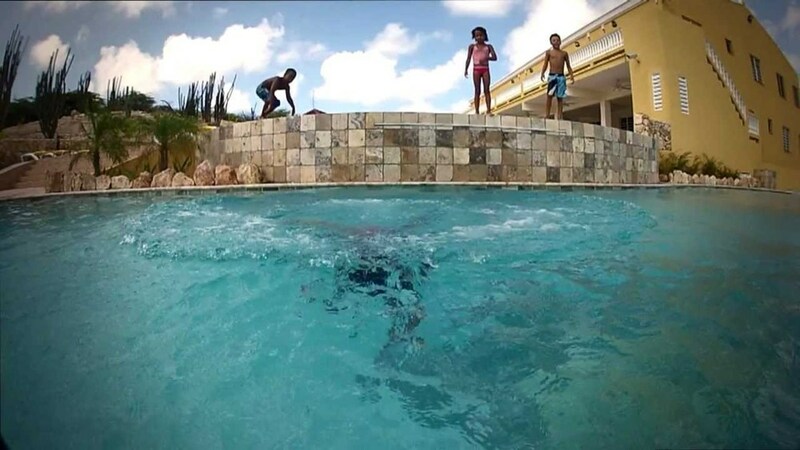 BSC Pool&Spa is the only pool constructor on Bonaire that works with AquaBRIGHT as a pool finish. This system has many benefits compared to the old pool coating. One of those is that the material doesn’t dissolve in your water like the old coating (slowly) does. Because of this, your water is brighter and cleaner. Another advantage is that AquaBRIGHT is pH-neutral because of which your water is easier to balance. Take a look at the photos of our commercial (Magna)pools in our portfolio. Call or email us for more information or an offer.